Kickin’ It is a new feature at The Bucket List where I round-up the whole month in one post, bringing you reviews you may have missed, other awesome bookish things, and even what I’m currently obsessed with in other media besides books. June was a good month. I started working on an internship, which I love. The amount of books I read this month surpassed what I read last month, due to finally getting out of school and into summer. Summer is here to stay, at least for a while now. Let’s enjoy it and keep reading! Lois Lane: Fallout by Gwenda Bond (5 stars): Superman may be able to see through your socks but Lois Lane will be able to blow them right off! Isla and the Happily Ever After by Stephanie Perkins (4 stars): Isla and the Happily Ever After does not live up to pervious Perkins’ novels, where the plot is concerned, but it makes for a cute and enjoyable read. Off the Page by Jodi Picoult and Samantha Van Leer (4 stars): Off the Page is YA, but I would peg it for younger YA, though it can be enjoyed by someone of any age. City Love by Susane Colasanti (3 stars): Colasanti will make readers fall in love with the city and have them looking up so they won’t miss a thing. 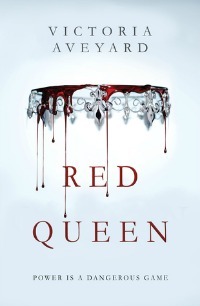 Red Queen by Victoria Aveyard: LOVED it. You need this book in your hands and should have been reading it five minutes ago. Review to come in July. The Shadow Behind the Stars by Rebecca Hahn (9/1/2015): A story told by the Fates, I am totally ready for this book! Lying Out Loud by Kody Keplinger (4/28/2015): Did you know that Keplinger's The DUFF had a companion novel? The Accident Season by Moria Fowley-Doyle (8/18/15): It sounds like Fowley-Doyle takes being accident-prone to a completely different level. Oblivion by Kelly Creagh (7/28/15): I'm currently reading the second book in the Nevermore series and I love it so much. This is third and final book and as much as I am terrible at finishing series, I just might finish this one. Go Set the Watchman by Harper Lee (7/14/15): I think this may be the most anticipated read for the whole year. To Kill A Mockingbird's author is about to bring us another story that may follow the fame of its first. The Fixer by Jennifer Lynn Barnes (7/7/15): I've never read anything by Jennifer Lynn Barnes but I would love to start. This sounds like an interesting book: a girl goes to a school where she fixes others' students problems. Sarah's Bookshelves (Big Reveal: A True Reader's Library with Anne Tollett Home): She is talking dream libraries and it’s absolutely stunning. I would love a library in my house. Bewitched Bookworms (Hello, I Love You by Katie M. Stout - Dreamcast and Giveaway): I have wanted to read Hello, I Love You for a very long time --- ever since I got back from Korea actually. Reading this interview made more interested than ever; I am a huge fan of Korean television and turns out that author of Hello, I Love You is familiar with Korean dramas as well. The Book Addicts Guide (The Stages of Starting a New Book by Your Favorite Author, as Told by The Princess Bride): If there is something equally awesome than books, it is The Princess Bride. The Princess Bride is one of my all-time favorite movies. I read Red Queen pretty soon after it came out and I LOVED IT. It seems like some people either really loved it our really didn't. But it definitely worked for me. And now there's even talk of a movie which is SO EXCITING. I read Off The Page this month and thought it was cute, too. AND YES The Accident Season looks really good!